WRT socks were still giving me sizing fits so I took them to the frog pond and started over again. This time from the top. 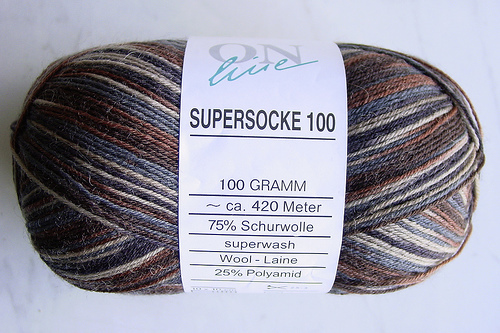 I’ve been doing more research on the yarn (ONline Supersocke 100) and it seems my experience isn’t that unusal. I like the yarn, I like the self striping and the firmness but it lacks the stretchy qualities of the other sock yarns I’ve worked with. I was used to more ‘spring’ requiring slightly smaller sizing with some negative ease rather than a more true sizing. oops! So…. after working several inches beyond the first unraveling, I decided not to risk socks on the floppy side and go for a more standard fit. Fortunately, the recipient prefers fairly short socks. This is good! Christmas is around the corner, this is very very good! I was able to do about 1.5″ 2×2 ribbing late last night and hope to get to heel on first one today. Being the silly sort it’s one at a time on this pair. All the other same sized dpn’s have other projects hanging on them. Mental note – freakin’ learn two on two circs and magic loop in ’09. Has anyone gone to Sock Summits before? It sounds like an awful lot of fun – I’d love to hear your experiences. Although it’s doubtful that I’ll make it this year…. it’s in the back of my wee brain! Seriously, I’d LOVE to hear comments on this. I’m not a sock maniac, just knit socks but it seems like a great way to learn, meet other knitters and have some fun. Perhaps I’ll put it on the docket for 2010. Yeah, that’s it! What are the project plans for ’09? Relearning cables, I want to do a proper Aran Pullover as well as a few other cabled projects. Expanding my lace knitting skills and have at least 3 shawls done. Make some to die for sweaters. Oh, and most importantly, relearn continental knitting. That’s the only way I’ll get everything done. And… in other news… I seriously need chocolate. This entry was posted in Knitting and tagged Knitting, ONline supersocke, sock knitting, sock summit 2009. Bookmark the permalink. WOOT! Looks like it was indeed ordained to be! You’re welcome! I can’t thank you enough for posting the Sock Summit! I had no idea it even existed and I’m vibrating I’m so excited. Not only because I have a sock knitting fetish but because my parent’s just moved to Portland and I’ve been looking at dates to go visit with the kids. It’s like it was ordained by the knitting gods! WOOT!